Senior EU officials urged her to grasp an olive branch from Labour opposition leader Jeremy Corbyn that echoed EU proposals for a permanent EU-UK customs union as a way to end deadlock on the Irish border "backstop". But EU sources said May had given little sign of how she planned to secure parliamentary support. Dispatched by parliament to revise an accord she struck with the EU that European leaders refuse to reopen, May flew into a storm provoked by the EU's Donald Tusk, who wished a "special place in hell" on those who had promoted Brexit with no clear plan for how to achieve it. Juncker and May issued a joint statement after what they called a "robust" discussion. It set out her demand for a legally binding change to the "backstop" plan to avoid customs checks on the Irish border, and his insistence that the other 27 EU member states would not reopen that agreement. 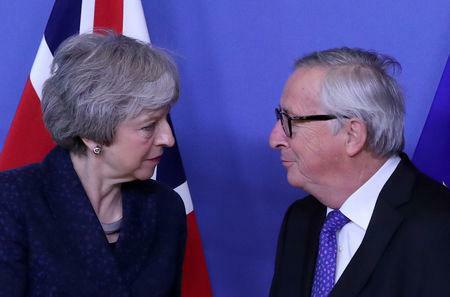 However, Juncker said the bloc would look at adding wording to the separate political declaration on future trade terms to see if a closer relationship could be agreed on -- one that EU officials say would render the backstop, under which Britain could be stuck with EU rules for years, largely redundant. "It is not going to be easy," May told a British television reporter. "But crucially, President Juncker and I have agreed that talks will now start to find a way through this, to find a way to get this over the line and to deliver on the concerns that parliament has so we get a majority in parliament. "What I see and hear from leaders is a desire for us to work together to ensure that we can deliver the UK leaving the European Union with a deal," she added. 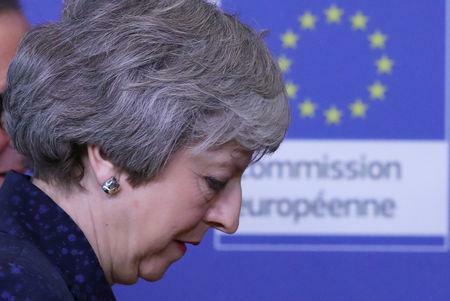 She will meet Juncker again before the end of the month as time gets perilously short for any kind of deal before Britain leaves on March 29. Tusk was cautious though, tweeting: "Still no breakthrough in sight. Talks will continue." 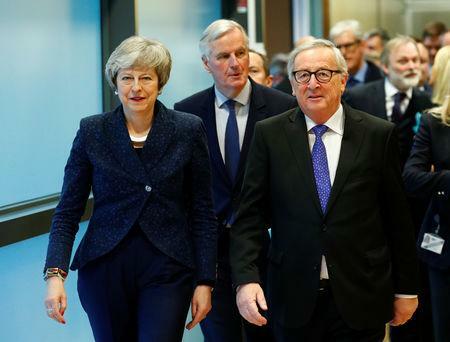 Several EU officials familiar with May's separate meetings with Juncker, Tusk and European Parliament leaders said she had given little away, repeating demands for legal changes that would limit the application of the backstop protocol - which British lawmakers say could undermine British sovereignty. She did, she said, chide Tusk for his remarks -- though Tusk pushed back, sources said, suggesting that the "truth hurts". Governor Mark Carney said: "The fog of Brexit is causing short-term volatility in the economic data and, more fundamentally, it is creating a series of tensions in the economy, tensions for business." He said a "no deal" Brexit, while not the likeliest outcome, had become more probable. German Chancellor Angela Merkel, the EU's most powerful leader, who has in recent days stressed the responsibility of both sides to reach an agreement, said a solution could be found without reopening the accord. In a letter to May released on Wednesday, Labour leader Corbyn set out five conditions for Labour to support a deal, including a "permanent and comprehensive" customs union with the bloc, which May has ruled out.